Floor Sanding St John's Wood NW8 | Best Price in London! Your floor is among the first things every visitor notices and it needs to look its best. Wooden floors remain ever-popular, because of their beauty and easy cleaning, but even the toughest hardwood floor needs restoration – every once in a while. Whether you have soft or hardwood floors, we can be of service in the process of their restoration. You can trust in our floor sanding in St John’s Wood NW8 to remove every blemish on your floor and seal it for years to come. What The Wood Floor Sanding for St John’s Wood NW8 Looks Like? The actual procedure doesn’t just strip and even-out the wood. The five-star St John’s Wood floor sanding we provide demands preparation and takes several steps to be successfully carried out. You can see a short guide with all the steps listed. Why The St John’s Wood Floor Sanding is the Right Choice for Your Floors? 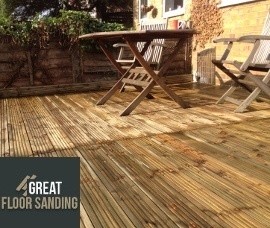 Years in the field of floor sanding in St John’s Wood have strengthened the performance, and all members of the teams have been BONA certified – the greatest testament to the experience and capabilities. Your floors are in the safest hands with the latest equipment and high-grade organic materials for filling out the gaps and sealing your floor. You return to your property to even floors and no sign of sawdust in the process. Efficiency, quality, and cleanliness. This is what you order with us as your wood floor sanding company. Request your viewing about wood floor sanding right now. Just gives us a call at 020 3404 9697 – the rest is up to us! You can contact us at any given moment during the week – be it a work day or the weekend, bank or national holiday. You also stand to receive a no-obligation quote 1 to 3 working days after the viewing and can call us anytime to make alterations to your scheduled appointment or request an update, or use our contact form or chat feature.